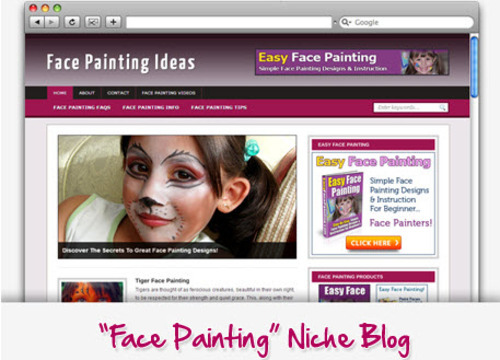 Face Painting Ideas and Tricks Blog - has been carefully prepared with articles, images, SEO optimization, Clickbank banners, AdSense, and more to ensure your success. * Videos Tutorials - Installing, Themes Options, Changing Links, Etc. * A Video page displaying relevant videos to each niche. Keeping visitors on your site longer improves your changes of a sale! * Add many more 125x125 or 300x250 banners if you want! This means you can promote more affiliate programs, sell advertising space, or add banners to your own products. * Brand New! Custom POST template which can be used for a squeeze page, sales page, sell your own product, do product reviews, and more! * Blog is zipped up and ready to install with Backup Buddy! License: Personal Private Label Rights - Can sell these blogs on Flippa after you have added content to make at least 50 percent more unique.